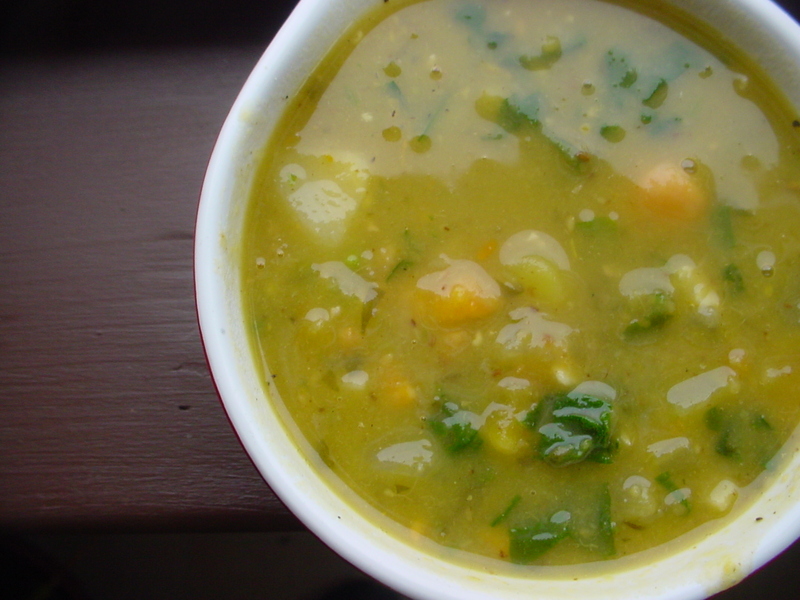 A good split pea soup is one of winter’s greatest pleasures. My mom made it often when I was growing up and she still reigns as the Pea Soup (or Sea Poup, thanks Dad) Queen. Hers used to be made with a meaty ham bone, but is now most often vegetarian, thick with sweet potato, celery, onions and carrot and spiced up with toasted cumin. At the Cafe, we’ve spiked our version with everything from pulled pork to maple sausage, always to good reviews. Last week I was making shrimp curry for our buffet and wanted a soup to complement it. Usually I make dhal, an East Indian dish often made with red lentils. We had no lentils, but we did have lots of green split peas, and so this recipe was born. In a large pot, bring the peas and water to a boil. Reduce to a simmer and cook for about an hour, until the peas are mostly tender. Meanwhile, heat a large frying pan over medium high heat and pour in the oil. Add the mustard seeds. They will toast and begin popping after a minute or so. Reduce the heat to medium, then stir in the onion and cook until beginning to soften, about five minutes. Add the ginger, garlic, turmeric, cumin and salt, and cook for a minute before adding the sweet potato, potato, and carrot. Cook, stirring often, for five minutes, then shut off the heat. When the split peas are almost tender, add the spice and vegetable mix to the pot. Simmer for a half hour (the peas should mostly have fallen apart at this point), then check for salt and stir in the spinach and garam masala. This soup was amazing…..followed the recipe exactly except I halved everything just because I was unsure of how it would taste. I wasn't even disappointed. Thank you so much!! !